Many PCs will eventually experience problems that go beyond a quick fix – these could be issues around installing updates, blue screen errors, network connectivity problems, malware infestation, or even trouble starting Windows itself. When one or more such catastrophic issues occur, before you give up on your PC, sometimes the best solution is to do a system reset of your device. What is a system reset? In simple terms, a reset removes the problematic copy of Windows from your device, along with any apps that run on it, and then replaces it with a fresh copy of Windows. It's a last-resort option to fix problems that make your device effectively unusable. The good news is that resetting is a simple process and Windows 10 comes with built-in tools that take care of it for you. If you’re not quite sure yet if it’s time for a reset, try checking the Windows Get Help app for possible solutions to your device’s problems. To find it, in the taskbar search box, type “help” and then click on Get Help. Also, many Microsoft Store locations offer service right there in the store. Find the store nearest you, and if service is available at that location, choose Schedule Service Appointment. Is your data backed up? Important or irreplaceable files and info such as pictures, documents, desktop items, music, videos, and so on should be backed up before starting a reset. This means storing these files on OneDrive or an external hard drive, or both. To learn more, learn how to back up with Windows to safeguard your information. Can you reinstall the apps that are currently on your PC? All apps that aren’t built in to Windows are removed during a reset, so make sure you can reinstall them. Any apps that you have downloaded from the Microsoft Store can be downloaded again once you sign back into the Store App with your Microsoft Account. Most other apps can be downloaded or reinstalled from the software provider’s website. Once you answer yes to both questions, you’re ready to start the reset. You don’t need any startup discs or files to reinstall Windows – it’s all handled automatically. The reset process usually requires one to three hours to complete. Select Start > Settings > Update & Security, then choose Recovery. To go there directly, type “recovery” into the taskbar search box and select Recovery options. 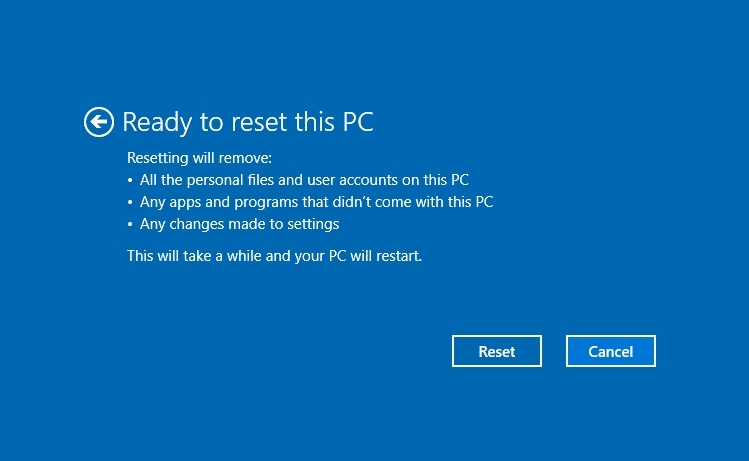 To begin the reset process, under Reset this PC, select Get Started. Next, choose the type of reset you want, either Keep my files or Remove everything. Both remove all programs and apps and reinstall Windows, along with the built-in Windows apps (such as the Start menu, Settings, Mail, Calendar, and Microsoft Edge). The option you choose depends on the type and severity of the issues on your PC. Keep my files. This is a good option if your computer is running slow, has issues with built-in apps, blue screen errors, spyware, or problems with updates. This removes Windows and any applications that were installed prior to resetting (the built-in Windows apps are reinstalled through the process), but your pictures, documents, desktop items, downloads, videos, and music files remain. Windows saves a list of the removed applications to your Desktop, so you can decide which ones you want to reinstall after the reset is done. A Keep my files reset can take up to 2 hours to complete. Remove everything. In technical terms, this is a “clean reinstall.” This is a good option if you are selling or donating your device, if your PC is infected with a virus, or if you've already done a Keep my files reset but the problems remain. A Remove everything reset does exactly what it says – it removes everything from your PC, including data, profiles, and programs. Any virus or similar issue is removed along with Windows and the apps. This reset is a fresh start for your PC. It can require as much as 3 hours to complete. Choose your reset option in the Ready to reset this PC box and then select Reset. Windows then automatically takes care of the reset process. In most cases, you won’t need to do anything until it is complete, unless the device you're resetting is a Surface. If so, the reset process might present a dialog box to ask if you would like to clear the TPM. The TPM (Trusted Platform Module) is a security feature in Surface and some newer devices. If this dialog box appears, press the F12 key or the increase volume button on your keyboard to continue. When the reset reaches the point where you can sign in to Windows and connect to the internet, first install all available Windows updates. To do this, press the Windows key on your keyboard, type update, choose Check for Updates, and then select the Check for Updates button. Repeat these steps until there aren’t any more updates to install. Make sure your PC is plugged in to a power outlet while checking for updates, to avoid interruptions. After the updates are installed, the reset is complete. As you reinstall your apps and start using your device, make sure the previous problems don’t reappear. If they’re gone, you’ve fixed your PC! Hopefully, your device will never have issues that lead you to reset Windows. But if it does, I hope this article helps you have the confidence to successfully do a reset and get your device working again as it should be.